The Office of Communications promotes Detroit Mercy Dental to a host of audiences in a variety of methods. Our office strives to share important news, stories, and headlines both internally and externally. We work with faculty, staff, students, patients, and alumni to share our pride and promote the School and its services. Throughout all our communications, we uphold both the University and School of Dentistry brand and serve as the point of contact regarding questions for each. Our blog shares headlines and information in real-time. It is updated multiple times a month and includes photographs and video content. The Detroit Mercy Dental bi-annual magazine is distributed in December and June. It is always an interesting read which includes a feature article focused on dentistry and dental education, and unique highlights about our students, faculty, staff, and alumni. The Leading Edge is available for read online and can also be delivered to your home. Read the latest version of the Leading Edge here. This prideful, internal newsletter gives kudos to the top five stories that happened each month. To submit a story, please contact us. This directory helps patients to find a local Detroit Mercy Dentist from whom they will receive quality, thoughtful, and trustworthy, care and is a useful marketing tool for our practicing alumni. Add yourself to our directly by clicking here. 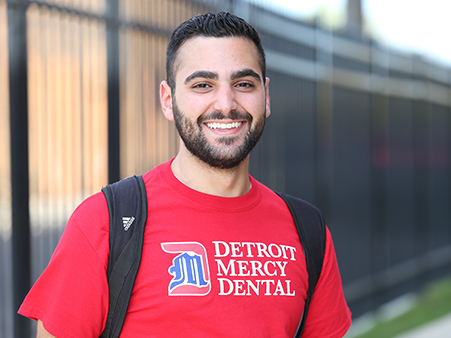 If you are a patient looking for a Detroit Mercy Dentist, click here. In attempts to help our outgoing students start their career, or alumni to find the best candidates for hire, we offer a free job board on our website. To visit our job board, click here. Throughout our campus, we post important content on digital signs. If you would like to share information, please contact us. From brochures to forms, booklets to banners, we develop content and produce informational materials to best describe and promote our programs, services, and events.